Quite a bit has changed since the last time you bought a dishwasher. You should still consider the premium brands like Bosch, Miele, and KitchenAid. However, the Korean companies, like LG and Samsung, have become more popular. In many ways, they have emulated the premium brands in terms of features. In this article, we will compare two of the largest companies in the industry, Samsung and KitchenAid. You will learn about their dishwasher features, reliability, when the best time to buy is, and how their dishwashers compare side-by-side. KitchenAid was originally the residential dishwasher brand of the commercial Hobart corporation. They were purchased by Whirlpool in the late 1980s. Their dishwashers are still their best and most popular single product 25 years later. KitchenAid has changed over the years to compete with the European imports Asko, Bosch, and Miele. First, the tub was changed to stainless and then they were engineered to be quieter. In fact, KitchenAid is the quietest dishwasher for the price. It is also manufactured in the US. Samsung is an incredibly well known Korean conglomerate emphasizing design as well as function. Their growth has been unbelievable, and they are the number one brand sold in the US in 2017. Last year there was unpleasant media attention surrounding their cell phone and laundry division due to recalls. However, they are statistically reliable in all other areas of appliances and currently ranked 7th in reliability for all our major suppliers. Samsung is made in South Korea. For Kitchen-Aid there are nineteen different models for your consideration, while Samsung offers eleven. Prices start at $500 for Samsung and $600 for KitchenAid depending on the promotion and time of year. Samsung's claim to fame is their waterfall technology. It sweeps in a vertical motion to wash tough stains of bottles and dishes instead of having a spray arm spinning at high RPM. Much of Samsung's technology innovates on common basic features found on other dishwasher brands. 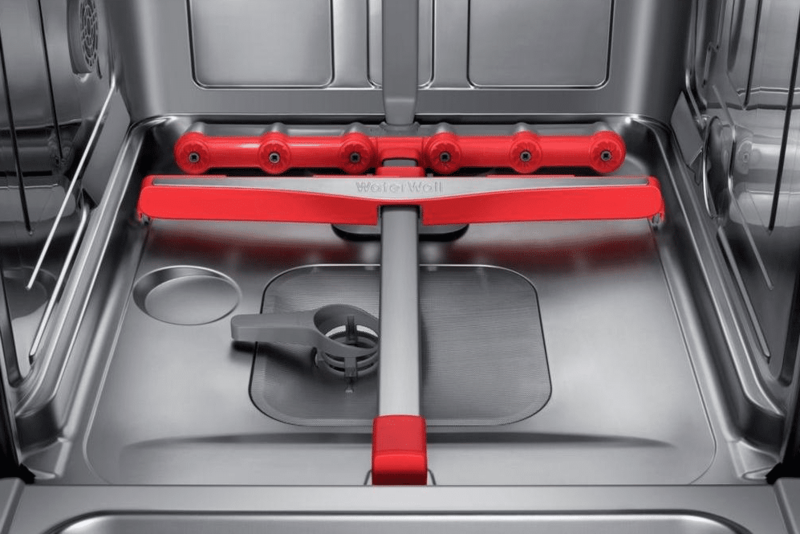 Kitchen-Aid's Dynamic Wash arm features nine wash arms in one for 3 times better coverage. This unique design has better coverage including hard to reach places. So you place any dish or utensil anywhere in the dishwasher. Another huge benefit is their ProDry system. It utilizes a recessed heating element, and a fan to draw moisture out of the wash tub. 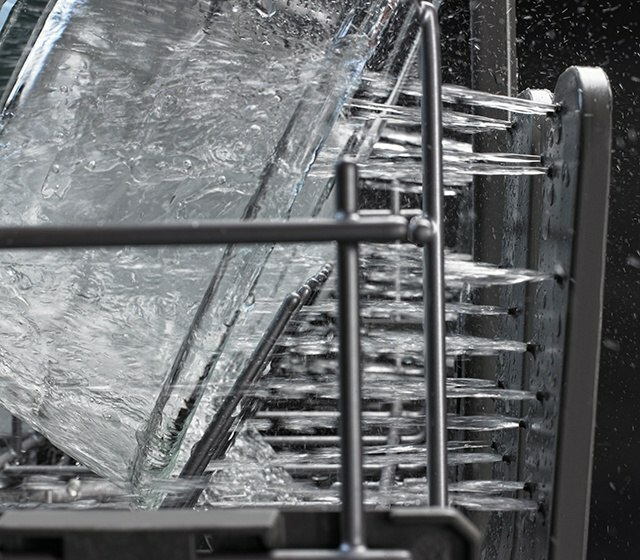 The clean water wash continuously removes food particles from the wash water. The result is clean wash water for excellent performance. Plus, there is no need to ever remove and clean the filter. You also have the ProScrub for a more concentrated wash below for your dishes with heavily baked-on residue like lasagna pans. If you have sports bottles, there is a separate wash just for larger bottles. Reliability is similar for both brands based on our 30,761 service calls logged in 2017. KitchenAid was 9.53% or 73 service calls out 766 dishwashers sold. Samsung was 8.42% or 24 service calls out of 285 dishwashers sold. However, most of Samsung’s sales are in the $400-600 range, whereas KitchenAid is $799 plus. 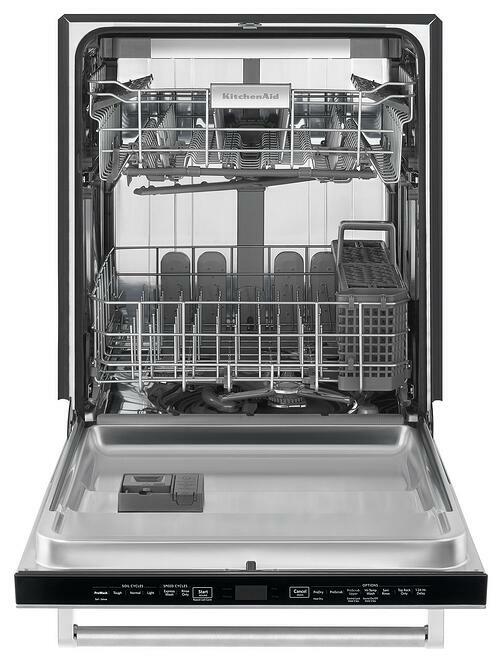 There isn’t much of a track record in terms of volume on the newer WaterWall dishwashers. Before we discuss these two dishwashers, Samsung has 3 less-featured units under $725. KitchenAid will have 1 depending on the promotion. Samsung and KitchenAid do compete in units $799 and above. Both of these are good, quiet dishwashers with third racks. You will have a choice of many different cycles from pots and pans to delicate. So, the difference becomes wash systems or the new version of the reliable wash arm system versus the new WaterWall. KitchenAid may be a better consideration because this design did not need to be refined, unlike refrigeration where Samsung dominates. Dishes, for the most part, have always been clean after being placed in a dishwasher. The bottle cycle on the second rack for KitchenAid is an excellent feature as well. Both are decent, but KitchenAid may be better for washing. Service down the line should be much faster and parts more readily available on the more basic KitchenAid design, too. One small note: Appliance prices change during promotions, especially around the holidays. Confused about the different dishwasher brands and features? 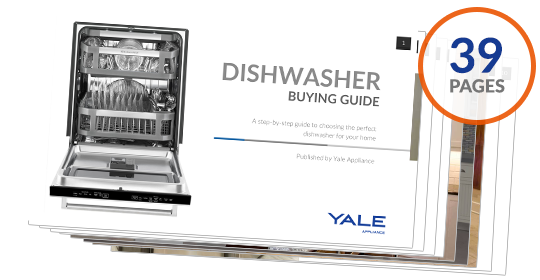 Get The Yale Dishwasher Buying Guide with features, specs, and profiles of the best brands like Miele, Bosch, KitchenAid, Electrolux and more. Over 355,000 people have read a Yale Guide.